Katherine Mansfield, a prominent modernist writer of short fiction, wrote, “It’s always a kind of race to get in as much as one can before it disappears.” She was referring to a story idea that arrives and needs to be written down. It’s best not to think about it too much. Writing allows things to unfold that wouldn’t happen when one only thinks the story through. Write it down as soon as possible and as much of it as possible. It’s a first draft, a fragment, a hint of the real story that will develop eventually. There is no how-to-manual for writing a short story. Maybe setting it aside for a while is important for the right moment to select the point of view or the succession of the events to work out. Every story has it’s own unique form. It can’t be rushed. It evolves over time if we let it. Be alert to when something emerges that we never dreamed we’d express. Don’t resist it, Embellish it. Trust it, and see if it’s right for the story. Want a goal for 2015? 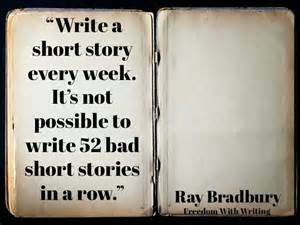 How about 52 short stories? Go for it, Elaine. I’ll cheer you on. 52 stories a year? Are you daft? I’m floundering with one every two weeks. I think Ray just said that to get his name in print — ha! LOL, LadyWinfred. Yes, I am daft if I meant 52 polished stories. Just 52 rough drafts would be nice. There’s no way I could do it with my schedule, but I can dream.